As fellow travel enthusiasts, we at Earthabitats have designed the perfect world map to journal your vacation memories. Whenever you have visited a country, scratch off the gold foil on top of that country to reveal the beautifully colored landscape underneath. Perfect for keeping track of the countries you have visited and planning your next adventure! What's more, our map gives you the feeling of accomplishment when you scratch off another country, and inspire you to scratch off all the countries one by one as you explore the world's wonders! Hang the Earthabitats Scratch Off World Map on your wall and you've got yourself a classy wall decoration, plus an awesome conversation starter for your guests. The guitar pick scratcher is a much better scratching tool than coins, giving you the ultimate scratching comfort and fine precision to cleanly scratch close borders. The memory stickers depict travel activities and memories, such as hiking, cruise, honeymoon, graduation trips and so on. Mark your memories on the map with the stickers! 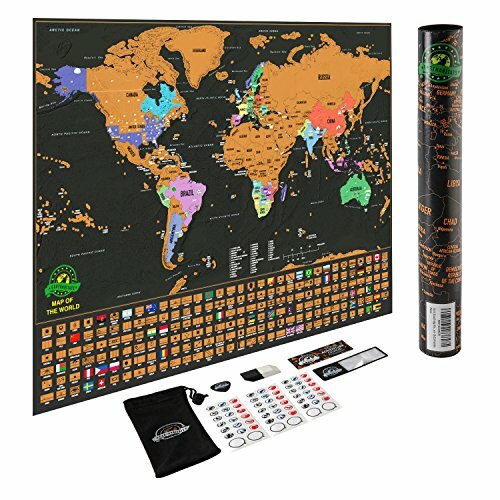 When you need a travel gift for that special traveller in your life, the Earthabitats Scratch Off World Map is a brilliant choice. Click "Add to Cart" above and scratch the world today! SCRATCH OFF MAP OF THE WORLD. The most detailed and beautiful scratch off map on the market, our map features vibrant colors on a classy matte black design, accurate cartographic details of the terrain, country flags and landmarks. Printed on thick 220GSM paper and protected with laminated finishing, our map arrives without scratches and ensures quality. US STATES OUTLINED. US state lines are clearly outlined for you to track your adventures with precision. State lines in Canada and Australia are marked too!